This year, Kiehl’s has created a limited edition Ultra Facial Cream designed by Matthew McConaughey. His vibrant design features uplifting colors and geometric shapes, including interlocking puzzle pieces a nod to the iconic Autism Speaks blue puzzle piece. Each limited edition Ultra Facial Cream purchased will help to provide resources for children and families living with autism worldwide. Total worldwide donation amount $200,000. Click HERE to share the video! A daily face moisturizer to support autism awareness. The Kiehl’s x Matthew McConaughey Limited Edition Ultra Facial Cream will be decorated with one-of-a-kind packaging created by the actor. McConaughey’s vibrant design features uplifting colors and geometric shapes, including interlocking puzzle pieces - a nod to the iconic Autism Speaks blue puzzle piece. The awareness campaign launching in tandem with the moisturizer will feature a short video of McConaughey as a call to get people talking about autism. 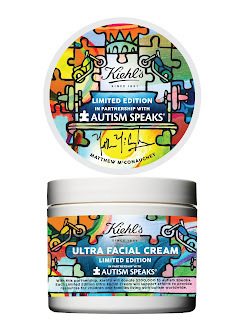 For every video share Kiehl’s will donate $1 to its Autism Speaks Campaign. Autism Spectrum Disorder (ASD), a developmental condition, is a global issue that affects over 1% of the world’s population. Notably, more children than ever before are being diagnosed with ASD. It is estimated that 1 in every 68 children is diagnosed with autism in the United States (and 1 in every 42 boys). In uniting these three forces - Kiehl’s, Autism Speaks and Matthew McConaughey - the campaign will raise awareness for autism, and work to change the future for children who struggle with the condition. First of all, I have to say that this is such a great cause and is definitely worth supporting! 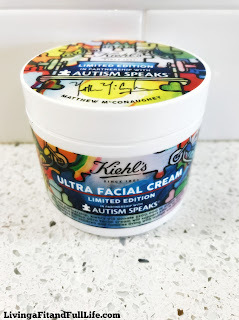 I think just about everyone knows someone with autism which is why I love that Kiehl's and Matthew McConaughey have joined forces to help raise awareness and funds for the world’s leading autism organization. Not only that, but they've come together to create the Ultra Facial Cream Limited Edition 2017 which happens to be an amazing product! Ultra Facial Cream Limited Edition 2017 is a daily face moisturizer that gives instant relief to people like me with dry skin. I love that it doesn't feel overly heavy and absorbs into the skin well. It heals my skin on contact and leaves it looking healthy and hydrated. It's the perfect daily face moisturizer. I also love how beautiful the packaging is and that it helps raise awareness for autism! Click HERE to support the cause and share the video! Click HERE to find a store near you that sells Kiehl’s! Click HERE to learn more about Kiehl’s! Follow Kiehl’s on social media!